Swiss artist Bustart joined the Not A Crime campaign with his monumental – four storeys tall – mural at the ABC school in Harlem. His picture of a schoolgirl with her toy tiger shows a series of drawings falling away. The drawings are copies of actual drawings by the children of the ABC school. And the fact that they're falling away represents the stolen dreams of young Iranian Baha'is denied their right to go to university by their own government. Lmnopi dedicated her Education Is Not A Crime mural to 11-year-old Marley Dias – the pioneering founder of the #1000BlackGirlBooks movement. Marley's story is an inspiring example of someone taking their education into their own hands and doing a service to other people. We thought it sounded a lot like the Baha'i Institute for Higher Education. Marthalicia Matarrita's delicate portrait of a young girl with the seeds of education and knowledge being planted in her mind is one of the most popular murals created for Education Is Not A Crime in Harlem. Tatyana Fazlalizadeh is half Iranian and half African-American – while her portrait of a little girl learning to read is all heart. Fazlalizadeh's work is deeply engaged with social justice and she was a powerful addition to the Education Is Not A Crime project. Col Wallnuts's distinctive colourful shapes, appearing on the side of a school, make up one of the campaign's largest murals in Harlem. And above a busy playground it blares its positive message to change the world. See One wanted to paint a woman looking across to a bright orb – her education. And he wanted it to be colourful; to give a blank, monochrome wall a searing streak of colours, vibrant and bright and all flowing from the woman's hair. Look also at her ear – there's a pencil tucked behind and it's just a bit broken to evoke the dangers of being denied an education. TatsCru is one of the legendary graffiti squads from the 1970s in New York. They began in the Bronx – and today they travel all over the world for their art. The week before they painted this mural for Not A Crime, they were in China. Their contribution to the campaign is this joyous and colourful celebration of not only education but the home of the Not A Crime campaign – Harlem itself. Chilean artist El Cekis painted this African American boy’s face, in profile, housing blocks blended into his skin, poised between a tangle of bars behind him and greenery ahead. The boy is reading a book. The lines on the page – visible to anyone who walks by – are from a poem by the jailed Iranian Baha’i and educator Mahvash Sabet. “I began to wonder whether these confines really defined the limits of my self,” Sabet’s poem says, “And then I saw in the heart of the tower / In the middle of the road / From the dry earth’s blistered core / … A few leaves sprouting / Green and neat.” Sabet’s words were written inside Evin Prison in Iran. But when paired with the face of an African American boy on a mural in Harlem they ceased to be one person’s prison poem and became a symbol of the Not A Crime campaign. Modelled after the famous gates of Tehran University in Iran, as well-known in that country as the dome of Columbia's library in the US, or the spires of Oxford in Europe, French artist Astro's trompe l'oeil mural in central Harlem has inspired passersby as a symbol of a path to light and hope amidst adversity. Carolina-born street artist Patch Whisky has a signature creature – he calls her Daisy. Patch created a special Reading Daisy – at 120th Street and 3rd Avenue – for the Not A Crime campaign. Daisy is reading a forbidden book of knowledge – notice the lock, which she was able to unlock thanks to finding the key – and so she's a perfect icon for striving to gain an education despite whatever obstacles or injustices. The beautiful Education Is Not A Crime mural at 126th Street, off Adam Clayton Powell Boulevard, on the back of PS154, shows two women who are actually collages of different women to symbolise the oneness of humanity. And Elle's mural has the distinction of being emblazoned with the largest rendering of the campaign name – Education Is Not A Crime – across Harlem. Erik Burke – aka OverUnder – painted a mural of flowers surrounding a mother with her child. And arcing over the piece is his slogan "Education Is Your Shield and Trophy" – already a hit in the neighborhood. Burke's piece is on the back of PS154, at 126th Street and Adam Clayton Powell Jr Boulevard, in the heart of Harlem. "Everybody should be free to go to school, to learn, to understand ... We need to take care of each other!" Alexandre Keto's Afro-fabulist mural at the PS7 school in East Harlem depicts a powerful mother figure watching over and educating her children in a lake. The fantastical setting is Keto's way of evoking many themes – education equality, care for the planet, and bridging communities of color and of suffering from around the world – in one piece. Nasim is a 29-year-old Iranian woman, an art student and photographer, and a Baha’i. The Australian artist Rone painted this portrait of her on the side of the Storefront Academy at Park Avenue and 129th Street in Harlem. Nasim was a student in the Baha’i Institute for Higher Education – the “underground university” that Baha’is created in Iran, because they’re banned from higher education – when, in 2009, Iran erupted into days of protests over the rigged reelection of then-president Mahmoud Ahmadinejad. Nasim was out taking photos when she was arrested and briefly detained by the authorities. She was held for a few days and government agents tried to force her to falsely confess that she and other Baha'is were responsible for the protests – she refused. Nasim was released but she decided to leave Iran. Today she is completing her art studies at UC San Diego. Franco "the Great" Gaskin is a Harlem legend. He has painted murals and roll-down gates across the neighbourhood – especially on 125th Street – for 30 or 40 years. His piece for the Not A Crime campaign, a message of education equality for people of all backgrounds, was a landmark for the project; a local celebrity helping raise awareness about the persecution of the Baha'is in Iran. "How can we let such a human rights violation exist in today's world? How can we have not realised that the suffering of one is the suffering of all?" Ricky Lee Gordon's piece – his second for the Not A Crime campaign, after his mural in Cape Town, South Africa – launched the campaign's 2016 series of murals across Harlem in New York City. His idea of "Gentle Hearts" – the young people whose rights have been violated, in Iran and anywhere – resonated with community members and with George Faison, owner of the Faison Firehouse Theatre, on which the mural was painted. American artist David Torres, also known as Rabi, is part of an art duo called Cyrcle. His artwork focuses on life and the human condition. His piece for #NotACrime is of a ruler broken in half with the words “Made In Iran,” to depict a shattered education system. His piece is in the Nelson Mandela memorial garden and is in support of access to education for Baha’is in Iran. For Brazilian artist Alexandre Keto, the marginalised Brazilians of African descent, are a key part of his art. He has always wanted to transform the lives of under-represented people and to try to create a community through his art. Alexandre has painted a wall on Frederick Douglass Blvd, depicting two women and a child under a baobab tree which symbolises knowledge and wisdom. The tree has the image of the Tehran University gates carved into its trunk resembling the barring of education for Bahai’s in Iran. Argentinian artist Marina Zumi now lives in Brazil where she is one of the most prominent female street artists. She came to street art from a background in fashion design, which influences her colourful, unique style. Zumi has painted a wall on Frederick Douglass Blvd, depicting a gazelle whose eyes have been censored by a red line. The words "No Truth No Light" stand in striking white underneath an image of the gates of Tehran University. This work is painted in support of the freedom of education for the Baha’is in Iran. Icy and Sot, sibling duo, are originally from Tabriz, Iran. They are famous in the Iranian urban art culture for their artistic accomplishments. They now live and work in Brooklyn, NY and continue to dismantle pre-conceived notions of Iranian tradition through their street art. Their work encompasses themes of human rights, justice, social and political causes. For #NotACrime, the artists have used their signature black and white stencils to depict imprisoned Iranian cartoonist Atena Farghadani with a backdrop of protesters, to show their support for freedom of expression in Iran. American artist Jennifer Caviola, also known as Cake, is from New York. She is a fine artist who loves to work in public places to show her solidarity with women in the form of portraiture. Her work has been featured in The Huffington Post and Vogue, amongst others. Cake’s piece for #NotACrime can be seen in Jersey City. For this piece she has painted imprisoned Mahvash Sabet, an Iranian poetess and teacher. She paints to show her support for the freedom of education for Baha’is in Iran. Iranian-American artist Nicky Nodjoumi was exiled from Iran in 1979, for creating artwork that criticised the Shah’s regime. He currently lives in New York and has had his art exhibited in the Metropolitan Museum of Art and the British Museum in London, amongst other prominent venues. 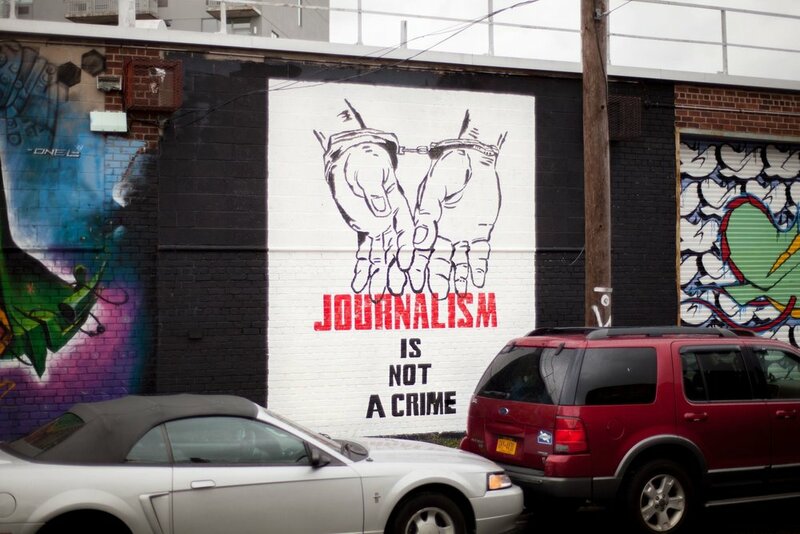 His piece for #NotACrime depicts a pair of handcuffed hands with the words “Journalism Is Not A Crime”. His piece is located in Long Island City and is in support of the freedom of journalists in Iran. Brooklyn based duo, ASVP began working together in 2007. Their art is a combination of multi-layered graphics with a mix of Eastern and Western imagery and bright, bold colours. They also use comic and pop culture graphics to satirise the advertising industry. For #NotACrime, the duo are creating a mural of a pencil with spikes along the shaft to depict the restriction of access to education for Baha’is in Iran. Italian artist Jacopo Ceccarelli, known as 2501, began graffiti at the age of 14. He went to the South American school of street art in Brazil where he formulated his artistic style – depicting nature through the abstract. His works have been exhibited all over the world including the Museum of Contemporary Art in Rome. For #NotACrime, 2501 painted a public mural on the corner of Lexington Avenue, depicting birds breaking free from a cage. His piece is in support of freedom for journalists in Iran. Faith47 is a South African street artist whose career spans more than 15 years. Through her art, she explores global political aims and advance the expression of personal truth. Her work has been exhibited and installed all over the world. For #NotACrime, Faith47 painted a mural on Colombia and Woodhull Streets in Brooklyn depicting Atena Farghadani in a headscarf without a mouth. Farghadani, an Iranian artist and political activist is sentenced to 12 years in prison for drawing a politically motivated cartoon. Faith47 paints in support of freedom of journalists in Iran. Jason Woodside is an American artist and native to New York City. He attended the School of Visual Arts and has collaborated with Adidas, Saatchi & Saatchi, and Obey Clothing amongst others. His piece is painted on Frederick Douglass Blvd with his signature colours that mark his work. His piece is in support of access to education for Baha’is in Iran.